40+ fashion, dressing for winter, fashion over 50, first snowfall. Winter has come, folks. Mother nature threw us a curve ball yesterday, and suddenly our predicted flurries turned into fifteen cm of snow. And high winds. And, as of 5 o’clock this afternoon, it’s still snowing. Why, it’s so miserable even the geese are leaving. This November is turning out so very different from last year. Remember last year, with its sunny days? And its sunny ways … but let’s not go there. 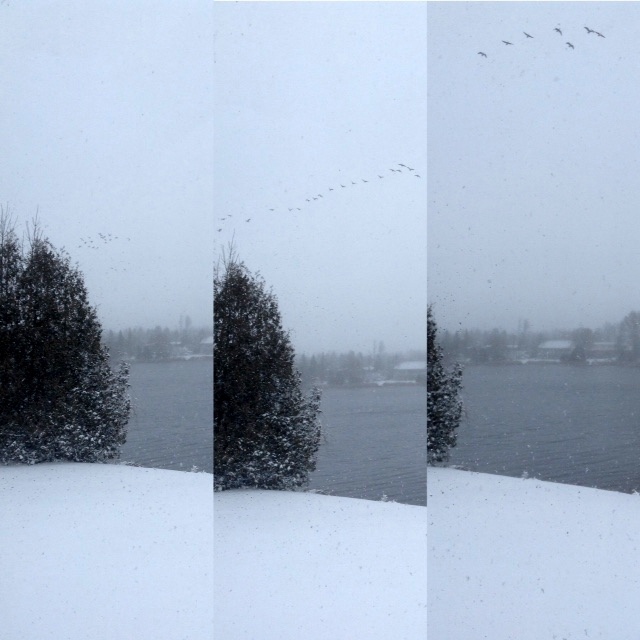 Our resident flock of Canada geese…going, going, almost gone. So this morning, after lingering over his third cup of tea, and with much groaning and rueful laughter, Hubby swathed himself in his winter woollies for the first time this year and braved the elements. His intention was to shovel the back step, dig the barbeque out of a snowdrift so he could put the winter cover on, plow the driveway, and the sidewalks. And then begin to dig the three foot snow drift out of the ditch beside our driveway. So he could then shovel the huge pile of leaves which blew in the other day, before the snowfall, and which he has been meaning to remove because they are blocking the culvert which runs under the driveway. Country living is complicated. I know my mum is reading this and saying, “Ha. You call that country living?” Anyway. Hubby was wrapped and layered up to the eyeballs, and groaning, as he headed out the door this morning. And me… I was very sympathetic. I reminded him of the many, many times he teased me when I’d sigh and moan about the cold. “Come on, Suz. Winter is great… as long as you’re dressed for it.” “Come on, Stu…” I chortled. Well, you can guess at the rest. Not sure that was helpful of me, actually. But I had troubles of my own this morning. Like, what to wear to start my Christmas shopping? I had planned to wear my new Stuart Weitzman boots and these comfy, black Vince leggings. And I intended to give my burgundy Theory shirt an outing. Bought in 2007, this shirt has been a workhorse. And it’s the perfect colour to go with my new Max Mara coat. And to add a bit of interest, I’d planned to wear this long, gauzy cashmere scarf. 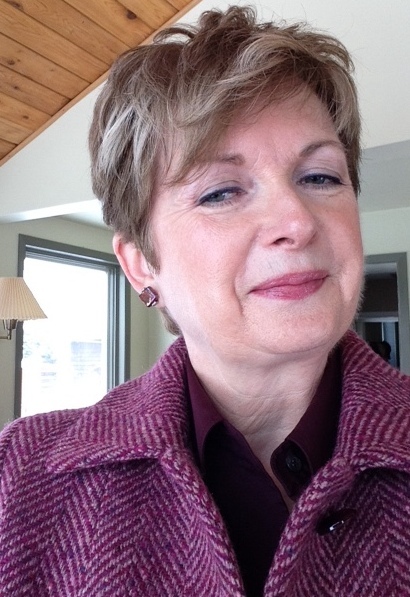 The colour works well with my new coat and the burgundy shirt. I’d be comfortable in the light coat. And most importantly not too hot for mall shopping. Now, though, it looked as if being too hot was the least of my worries. Okay, so a Plan B was definitely in order. First, I layered a pair of pantyhose under my leggings. Yep. I know it might be weird, but I wear pantyhose under most of my pants all winter. I can’t stand having cold legs. I still wanted to wear my burgundy shirt, so I hauled a light-weight cashmere sweater out of my drawer. I used to wear this cream, cable knit sweater a lot when I worked; it’s great over a cami or a tee shirt with dress pants. And although I don’t wear it often anymore, it didn’t go in the big “curated closet” cull. Mostly because you never know when you might need a nice light sweater. Like today. It will add warmth, but not bulk, under my light coat. Before I go on, I want to show you the earrings I bought a couple of weeks ago at Magpie Jewellry. I stopped in while boot shopping to see if they had any new Anne Marie Chagnon pieces. And I bought these studs. They’re a little chunky, kind of pink and kind of burgundy depending on how the light hits them, and I love them with all the burgundy I’m wearing this season. You can find the same pair in indigo on Anne Marie Chagnon’s website here. Now, back to the layering. I added my burgundy wool scarf. And this old toque and mittens. I was bundled, but not necessarily to the eyeballs, like Hubby. I’d be warm enough on my way to and from the car. Even with the snow and the wind. My hat and scarf could come off when I reached the mall and be stashed in my bag. Or even left behind in the car if I used the underground parking. So, off I went. But… then… I saw out the bedroom window that Hubby was still gamely shoveling in the ditch. Maybe that snow drift was a bit higher than three feet. Maybe, now that I was all bundled, I should go out and help him, you might be saying. What? Are you crazy? In my good coat? Still. Sigh. You might have guessed where this is going. I guiltily un-bundled myself from my good clothes, and got re-bundled in my sweats and ski jacket to go help. But by then, Hubby was back inside. Stamping snow off his boots. All done shoveling, and ready for a hot cup of tea. So, we had tea, and chatted about our trip plans. And by then I’d lost all interest in getting re-re-bundled back into my good outfit for shopping. Besides, the roads were probably a mess. And it was still snowing. And I could always start my shopping another day, couldn’t I? You know, Hubby’s right; winter can be wonderful. As long as I’m dressed for it. But driving in a snowstorm is never wonderful. If it’s one thing I hate more than the idea of battling Black Friday sale line-ups… it’s the thought of battling traffic tie-ups in a snow storm…. when I don’t have to. And since I’m retired… I don’t have to. I mean, there’s always tomorrow. Or next week. A lull in the storm. Look at the snow in that overhang. Somebody should shovel that off. How about you, friends? Started your Christmas shopping yet? Had any snow? How easy is it for you to be dissuaded from leaving the house on a miserable day…when you don’t really have to go? I applaud your decision — especially since we readers still got to witness all the fun of trying out different shopping outfits (and they all look good!). I have to say that although we don't get snow as often or cold as deep out on the West Coast, island life poses some challenges of its own in the form of stormy waters that threaten docks and make crossings "to town" too dramatic. Watching the weather reports back home from our getaway here in France, we're feeling better and better about our decision to move to a city condo. 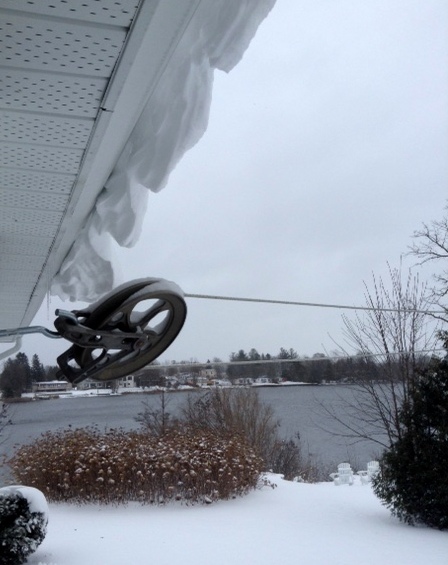 . . no more climbing on the roof after a storm to clear gutters or heading down to the dock at 2 in the morning to check the boat's moorings…Or negotiating an icy dock bucking with each wave… I miss my garden, I miss my view, I miss my neighbours, but the weather logistics, not so much. . . That said, I like your attitude: When the weather doesn't suit, just stay home. There's always another day for shopping! Great post Sue and at least you've various outfits organised for when you do go Christmas shopping! Don't forget to have a relaxing coffee first whilst reviewing or writing your list! All your outfit choices look lovely, by the way. I just Love snow and all the clothing choices it requires! Stu's right ….no such thing as bad weather, just bad clothing choices!! On a more serious note, that last sentence makes me reflect on how lucky we are to have warm, waterproof clothing and boots so that we don't feel the damp and cold …. As I mentioned I do love the snow …lots! but I can see what hard work it means for you both. We don't often have very heavy falls of snow here but if we do it's just a path along the driveway that we need to clear. It's a blessing that we can walk into the town and it's so beautiful when the area around the river is covered in snow. So it's on with my boots warm clothes (layers!) scarf gloves and my favourite woolly hat 🙂 oh and a small backpack for necessities. I'm imagining you curling up on the sofa with a cup of tea, good book and the snow falling outside ….hopefully I'll be doing that in Switzerland in a month or so …with coffee though, I don't like tea!! 🙂 have a good week! We have no snow yet, but it's suddenly FRIGID. We had a 40 degree drop over 24 hours, and this morning it's 20F outside! Brrr. Your layering looks wonderful and warm without being bulky. And I had to laugh at how your day went. I often start the morning with big plans and decide over a few hours that tomorrow is another day. Now that I'm retired, I can do that and it feels wonderful. As for Christmas shopping, I've done a bit online, but nothing much in the stores yet. It's sunny here, so I'll likely do a bit of shopping today, but maybe not? A good book on the sofa on a sunny day is always lovely. One of the joys of retirement, Laurel. Last minute rescheduling due to whatever reason I darn well choose. Thanks Pepper. The sunshine will be melting the snow in a day or two. Meanwhile the roads are back to normal. You're right; it's no fun sitting in the ditch…selfie or no selfie. Ha. Loved that. I envy you your snow , so pretty , but I realise it's not without problems . We can get lots but not in recent years . Sometimes we drive up into the hills to see real snow , with a shovel just in case . Good excuse to have a pub lunch too . I guess in Canada you are all geared up for efficient snow clearance – not quite the case here ! Me too….I always love the first snowfall. As long as I don't have to get up in the morning and drive to work. Which I don't anymore. Yah. I don't miss the snow, at all. The heavy clothing and many layers, the shovelling, scraping of car windows, and the slippery driving conditions are just some of the reasons why I chose not to live in Ontario, even though it was home. The rain on the west coast does get to me sometimes but then we get a beautiful sunny day or two. My soul rejoices. I love how you demonstrated how easy it is to take your outfit from a fall look to winter suited. The mountain is about a 35 minute drive and we can get our dose of snow and sunshine. Do you ski Calabogie? No. We hung up our downhill skis a few years ago… too many line-ups, crowded, and I was never comfortable with borders bombing down the hill around me since I'm not a confident skier. Plus the season around here has always been so iffy. And we had to drive hours to get to a decent hill. So, now we only cross-country. Still some hills doing that..especially when we go to Algonquin Park for a few days. Not to mention fewer people, and easier access for us. We can ski every day if we want just across the road. I've never skied Calabogie, but Hubby used to back in the day. That is quite the temperature difference. Wonder which is worse…dressing for extreme heat…or chilly rainy days? Just looking at this makes me want to hibernate till April. We haven't gotten any snow out my way … yet but I have been bundling up as it feels like -6 C outside with the windchill. 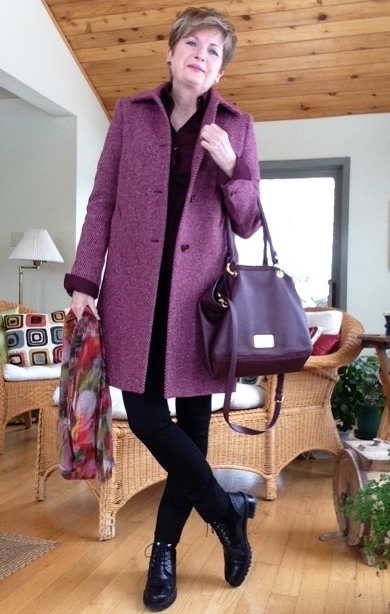 All of my wonderful spring/fall coats only got taken out for a week this year as it seems we went straight from 20 C to -6 C.
I love the colour of your coat and I have one that is very similar, a brighter magenta in almost the exact same cut I've been wearing for the past two days. The first snow of the year it is always best not to drive anywhere. Too many accidents from drivers forgetting what it is like driving in the snow. I know, eh? The first week of winter we 're all acclimatizing. That magenta coat must look wonderful with your red hair, Suzanne. Finished my Christmas shopping today except for a couple of stocking stuffers! I'm with you when it comes to unnecessary winter driving though, so I was happy to get home before the weather turned nasty today. It's been a grey, gloomy November here in Alberta. We don't have a lot of snow yet, but this afternoon's fog and freezing mist was enough. You are very well organized, Elaine. Makes me panic a little…as I've not even started. Still Christmas shopping is NOT a competitive sport. Ha. Unless your one of those Black Friday shoppers I mentioned in my last post. No, I'm definitely not a Black Friday or Boxing Day shopper! Your coat is super cute! WE had that last year. Warm and sunny right through until Christmas. We even went for our walk in the woods last Christmas Eve in 17 degrees Celsius temps. Felt too strange, though. Infrequent snow here in the US mid-east coast, so consequently no one knows how to either clear it off the roads or drive in it. I just stay home when it snows, cannot IMAGINE driving in it. You are so intrepid! Thanks for linking up to the Top of the World Style linkup party. 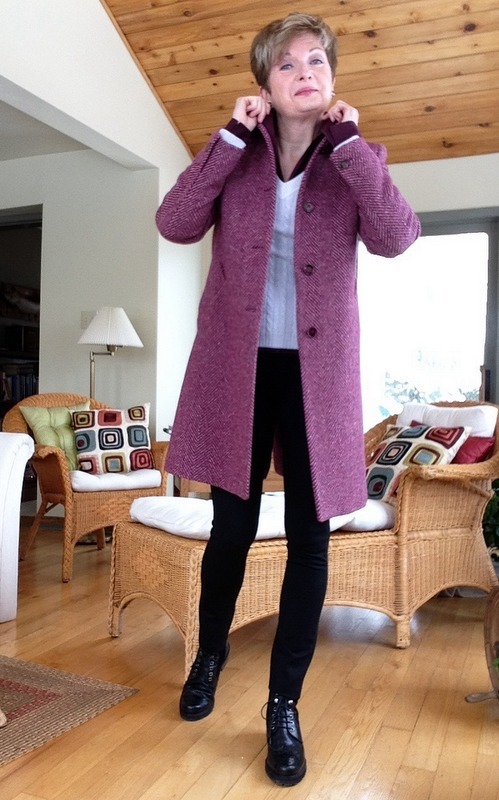 this is a very nice winter coat and the color is perfect on you! We rarely see snow…would love to see it more! This is a great coat for you!! But at least you got a blog post out of it, right? 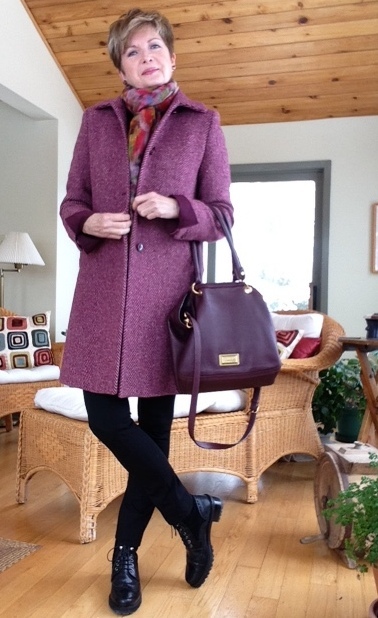 Love that coat—it's always so fun to have a great color coat!